It’s a winter evening and I’m visiting Stuart and Pat Margolin at their Lewisburg home. Dogs are coming and going, and I’m trying to get a handle on Stuart’s six decades of work in the entertainment industry. For a self-described “problem child,” Margolin has done pretty well for himself. The award-winning actor, director and writer, who has made his home in the Greenbrier Valley since 2005, has managed to find steady work on stage, in film and on television since his late teens. He’s not sitting on his laurels, dusting his Emmys. He recently filmed several episodes of The X Files in Vancouver, and he’s shopping What the Night Can Do, a feature film he wrote and stars in, around to festivals, hoping to find a distributor. The former star of The Rockford Files exudes quiet confidence. He’s unpretentious, but it’s hard for him to talk about his dozens of television and film projects without mentioning the celebrities who have been his friends and coworkers. He has rarely seen his own name in the marquee lights, but he’s had a longer and more varied career than many stars. 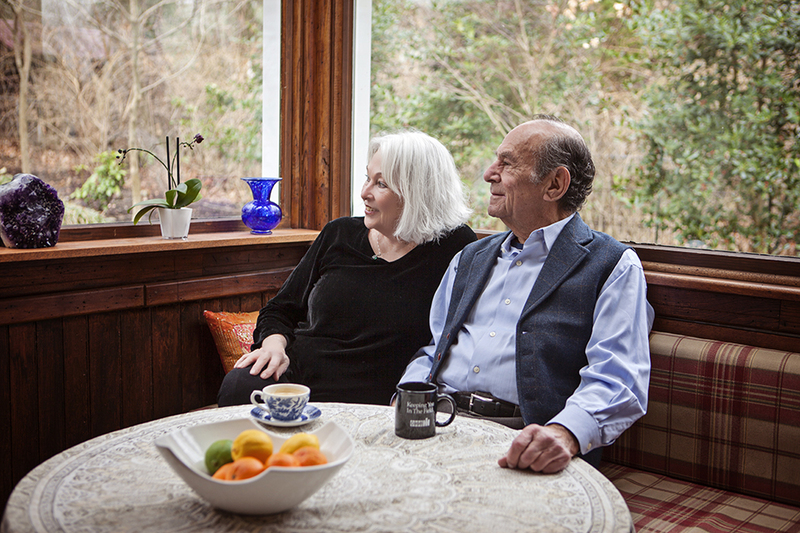 Stuart with his wife Pat at their home in Lewisburg. Margolin is atypical—he wasn’t a theatre kid who grew up stealing scenes in high school shows. “I was a young hoodlum from Dallas,” he remembers of his less-than-glorious early years. “I was kicked out of the Texas public schools and my parents sent me to a boarding school in Tennessee.” In the meanwhile his family relocated to Scottsdale, Arizona, a move that didn’t suit him. He missed his friends, so at 15½ he ran away, driving 1000 miles from Scottsdale to Dallas. His parents threw in the towel and enrolled him in a private school in Dallas. He wound up in juvenile court, which, as luck would have it, was where he met his future wife. Enter Patricia Dunne. “I was attending a Catholic girls school and I was a good student,” she relates. “I was chosen for a project that Justice Sarah T. Hughes had. She was trying to reform the Texas juvenile justice system. She thought that young people charged with misdemeanors should be judged by their peers. I met Stuart one Saturday when he was the defendant and I was the juvenile judge. I remember how he was slouched down in his seat. I kept looking at him. I was worried that I might be attracted to bad boys.” It was the beginning of their long friendship and eventual marriage. The story gets more complicated. Stuart’s older brother, Arnold, was studying journalism at Columbia University. Through a quirk Arnold ended up on Broadway, playing Peter in The Diary of Anne Frank when the original actor was drafted. Stuart showed up on his brother’s Greenwich Village doorstep, moved in with him and continued his high school education at the Professional Children’s School, which caters to students who are performers or whose parents are in the entertainment industry. “Some of my classmates had agents,” he remembers. He kept in touch with Pat, who was in school in Louisiana, and she accumulated a shoebox full of letters from him. Arnold suggested to Stuart that he go to a summer theatre camp in Steamboat Springs, Colorado. His only theatrical experience had come at age 8, when he played Puck in A Midsummer Night’s Dream, and 11, when a director at the Dallas Little Theatre remembered him and cast him as Mauro in The Time of the Cuckoo. Despite this slender resume, Steamboat Springs sounded like a good idea. While he was there he received encouragement from Barney Brown, a mentor of Dustin Hoffman, Gene Hackman and Robert Duval. Brown told him he could probably make a living acting, a little pat on the back that would change the course of his life. He started to go into real estate in Arizona, but he ended up calling Barney Brown, who at the time was an acting teacher and director at the Pasadena Playhouse. He moved to California and went to work as an actor. One job led to another, and today he’s still working on both sides of the camera. I was fascinated by this backstory. I’d expected to spend the evening talking about The Rockford Files, but here we were an hour later and we’d only gotten up to age 20. Margolin’s rambling teenage years seemed film-worthy. The fact that his high school girlfriend/juvenile judge was sitting there with us added to the intrigue. His story becomes more traditional at this point, with a lot of back and forth between LA and New York, roles leading to more roles, and memberships in Actor’s Equity, the Screen Actor’s Guild, the Writers Guild of America and the Directors Guild of America. There’s an old saw in Hollywood that everybody wants to be what they aren’t: actors want to be directors, directors want to be writers and writers want to be actors. Margolin addressed the problem by going into all three lines of work and rotating among projects. In addition to his Emmy Award-winning role as Rockford’s former prison buddy, Angel, on The Rockford Files, his television acting credits include roles on M.A.S.H., The Mary Tyler Moore Show, Rhoda, The Monkees, The Partridge Family, Love, American Style, Magnum, P.I., Matlock, Hill Street Blues, Saturday Night Live and 30 Rock. His television directing credits include episodes of Magnum, Quantum Leap, Wonder Woman, Touched by an Angel, The Love Boat and Northern Exposure. In 1996, the first year the award was given by the Directors Guild of America, he won Best Director of a Family Film for his feature film Salt Water Moose. In the meanwhile, in his personal life, an early marriage didn’t work out. He was traveling a lot, and a film project that took him to Yugoslavia for 6 months spelled the end of his first shot at married life. Pat, who had been living in San Francisco and then Woodstock, New York, had also married and divorced. She was a single mother with three children when Stuart called and came to visit her. What was meant to be happened—they ended up together. Stuart knew they could live anywhere and he could still fly off to work, so the family moved to a farmhouse on Salt Spring Island, an artists’ colony off the coast of British Columbia. He was back on the road less traveled. Far from the madding crowd, they lived on the island for 22 years. They raised their daughter and two sons there, sending them to prep schools across the Georgia Strait on Vancouver Island. Stuart’s work required constant travel, and, believing that travel was as educational as sitting in a classroom, they would pull the kids out of school and take them along on film locations. One of their trips involved a four-month stay in Rome, where Stuart was directing an Italian mini-series. The children’s exposure to the entertainment business influenced their career choices. Christopher Martini graduated from the Tisch School of Arts at NYU and is a producer/director; Michelle Martini graduated from the Rhode Island School of Design and is a costume designer; Max Martini graduated from the School of Visual Arts in New York and is an actor. When they finally decided to leave the island they moved to New York, and then Natchez, Mississippi, a town Stuart discovered while he was working on a project. The stories were fascinating, but I was itching to pose the question every reader of The Greenbrier Valley Quarterly would have: How in the world did you end up here? They had an unlikely answer. Strangely enough for someone who had devoted a lifetime to acting, directing, and writing, he wasn’t particularly aware of Lewisburg’s arts scene when he moved here, but he soon made a discovery. Cathey Sawyer at the Greenbrier Valley Theatre reminded him that that had met years ago in Memphis, when he was involved in a project there. They renewed their relationship, and he has appeared at GVT in two plays. Stuart and his brother Arnold starred in a 2015 production of Neil Simon’s Laughter on the 23rd Floor. He recruited Gretchen Corbett, a former Rockford Files co-star, to appear with him in the theatre’s production of On Golden Pond, a play he’d never read or seen before. The show had the misfortune of running during the historic 2016 flood, which filled the theatre’s basement, where the costumes and props are stored. Despite the unbelievable mess downstairs, the show missed only one performance, on a night the whole county lost power. This year, he will appear in Enemy of the People. This coming of age story about a 12-year-old girl was filmed in Alderson, Gap Mills, White Sulphur Springs, Frankford and Lewisburg. Both of his talented stepsons were involved, Christopher as director and Max in a major role. Scenes were shot in familiar Greenbrier Valley businesses, including The Big Wheel and Stuart’s Hot Dogs. Several locals appear as extras, including a nearly unrecognizable Kim Morgan Dean with blackened teeth. The Margolins are both avid readers. They read the New York Times, and Stuart’s making his way through Cormac McCarthy’s novels. He mentions Lincoln in the Bardo, by George Saunders, as something more recent that he enjoyed. Pat cites Landscape and Memory, by Simon Shama, as one of her favorite reads. “It’s a special place,” Stuart agrees. From problem child to Emmy Award winner to honored local citizen. Stuart Margolin has come a long way. And, strangely enough, he’s brought his juvenile judge along with him.